The 19-year-old Londoner’s debut video is all color and recklessness. Dua Lipa apparently left home at the age of 15 to live with her friends (the London singer-songwriter is 19 now), and we can't help but imagine that her life for the next few years was exactly like her debut video. "New Love" is like a rapid-fire montage of a 19-year-old's camera roll, leaping from night bus angst to bubble-blowing in restaurants to bike rides and dancing in grocery stores. But while it's hypnotic, the real draw is the smoky voice—that fans have come to love from her playful YouTube covers—anchoring it all. The song, produced by Lana Del Rey and FKA Twigs collaborator Emile Hayne and Andrew Wyatt, clatters and sparkles like every good new love anthem should, but allows the space for Lipa's vocal to hit where it hurts when she insists now I find it harder and harder to breathe. 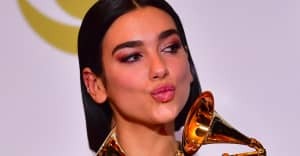 "'New Love' might sound like a classic tale of unrequited love," Dua Lipa told The FADER over email. "A fool that continues to go down the path of heartbreak, in the knowledge that they are fighting a losing game. But at the time I was writing this song it was about finding my place in an industry that often seems to neither want nor need you. This is a song about facing the fear of losing the only thing that matters to you." Watch it above.